With the fast development and frequent changes of the engineering products, natural resources are arbitrary exploited and the environment is used without repayment, which causes many problems of great magnitude such as zoology damaged all over the globe, resource waste and depletion, environmental pollution and so on. Therefore, remanufacturing engineering is the necessity of the current scenario to solve the ambivalence of economic development and resource shortcoming. 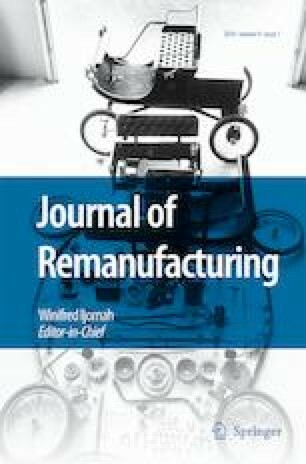 This article provides an insight on the economic analysis of remanufacturing engineering using a comparative analysis of upgraded part with the new part. Interestingly, hybrid electrochemical abrasive finishing (ECAF) have a unique capability to finish the 3d part in a single setup which majorly help to minimize the operation time. It is found that the remanufactured part cost only 42.12% of new part with 94% savings of material. No significant changes in realistic surface micro-structure and micro-hardness have been observed after ECAF process. SEM micrograph depicts the no presence of micro-cracks, craters, voids, scars and peeling on the rebuild surface. It means that the remanufactured part is able to perform like a new performer.